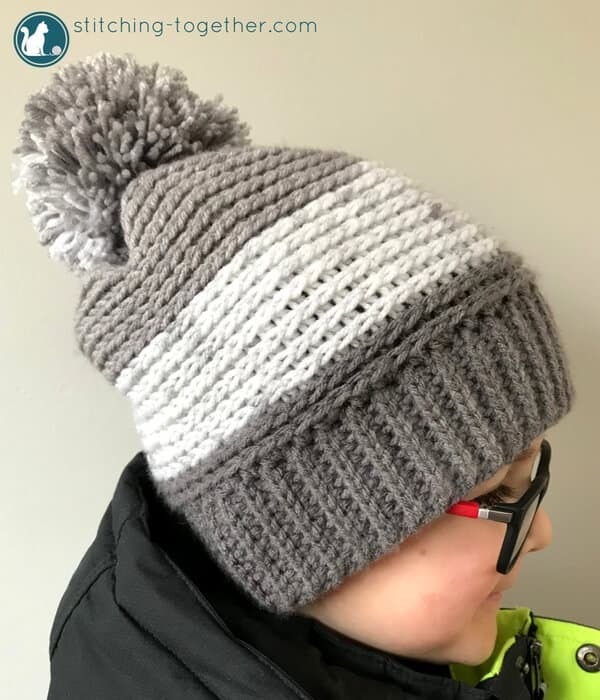 Below you will find the entire free pattern for the crochet slouchy hat – the North Shore Slouch. It is a great, flexible pattern which is sure to be a favorite! Please don’t forget to share it! 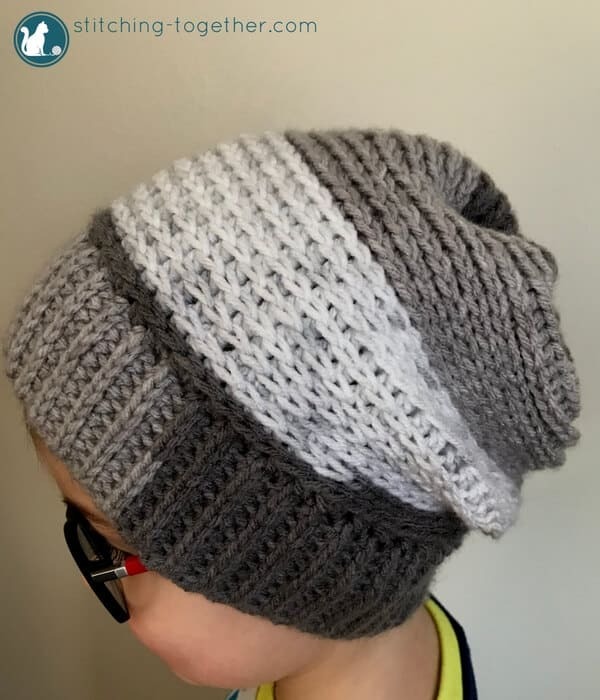 Slouchy hats are just so simple without having to worry about increases or decreases. Just round and round you go! 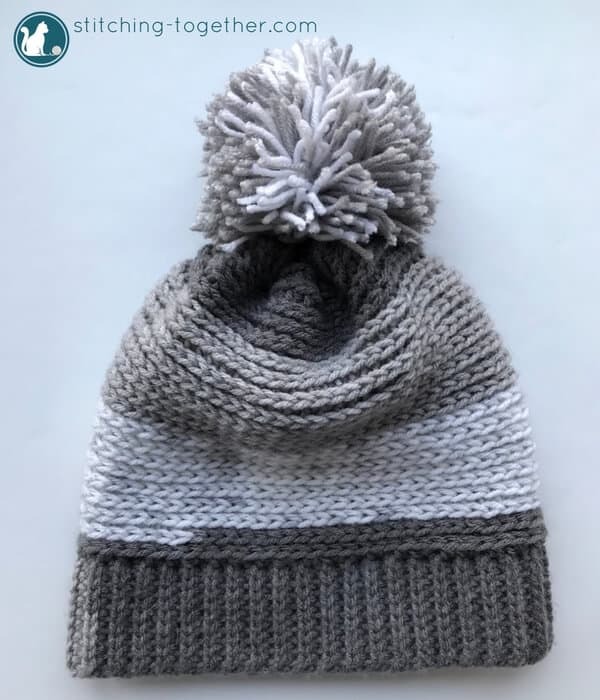 The North Shore Slouchy Hat uses the same stitches as the North Shore Hat but it is made into a large tube which is cinched together at the end. I LOVE the stitches in the band and love how the entire hat, including the band, has a knit look. 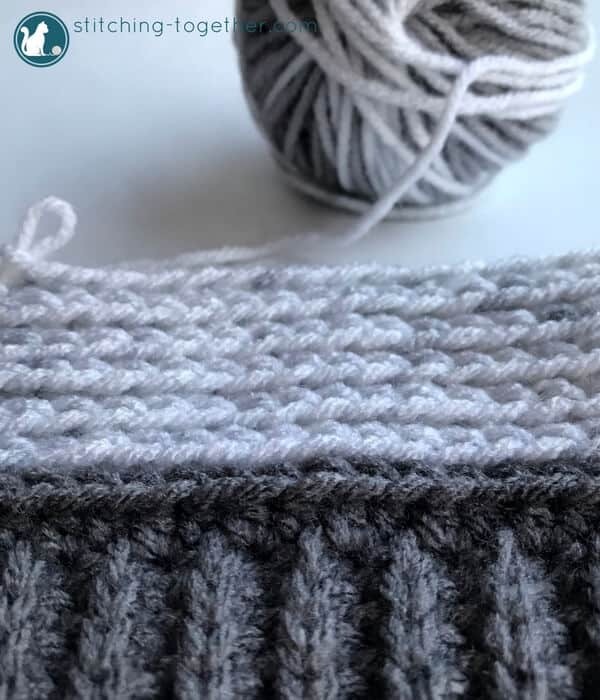 Check out the tutorial How to Single Crochet Rib Stitch to familiarize yourself with the stitches used to make the band. The band stitches are a little slower going, but the speediness of the rest of the hat makes up for the slowness of the band. Since the band does not have a lot of stretch, you will want to measure it to be just slightly smaller than the head circumference for a snug fit. You’ll notice I don’t specify the number of rows for the band. 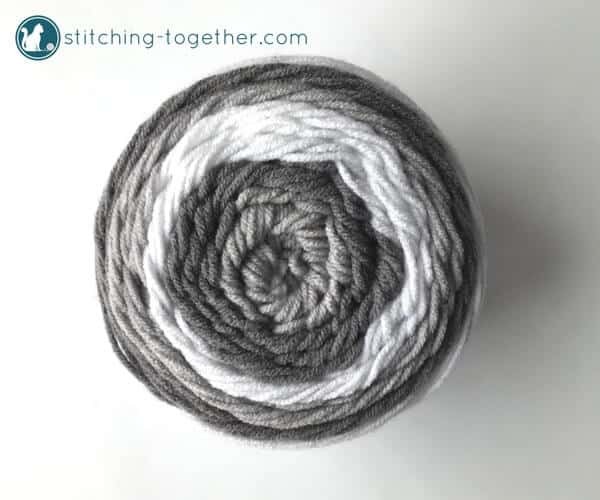 I wanted to leave this pattern as simple as possible for you to adjust the size and I think that measuring instead of counting rows is the easiest way to do that. Single crochet rib stitch – work up through the loop around the post of the sc in the row below. See the photo tutorial for how to single crochet rib stitch. The length of the band should be smaller than the circumference of the head. Example: for a head circumference of 20″ make the band between 19-19.5″ long for a snug fit. The circumference of the rest of the hat is determined by the length of the band. The length of the crochet slouchy hat from the bottom of the band to the top of the hat measures about 10″. For an adult size, add about two inches to the length (7 rounds). The instructions below are for a 19″ band which fits both my 3 year old (big hair) and 5 year old. Row 1: sc in 2nd ch from hook, sc in each ch across. Round 1: From the band, ch 2. Turn band horizontally, hdc in the first space on the side of the band, *2 hdc in next sp, hdc in next sp; repeat from * until the end of the band. Join with slst to the top of the ch 2 to form a circle (if you haven’t already joined the band). Round 2-23: Using your size J/10 crochet hook, chdc in each hdc. Do not join each round – just continue with the chdc. Rounds can be easily counted by counting up from the band opening if you haven’t joined it yet. Weave yarn through the ridge loops of hdcs at the top of the hat. Pull gently as you weave through the hdcs to cinch the top of the hat closed. Sew band together and weave in all ends. Adding a pom pom is adorable but totally optional! The hat is cute with or without it. Please tag me on social and using #stitchingtog so I can see your finished hats. I love seeing your finished projects! You can use the image below to pin this pattern for later! The edge of my brim is not even, as it is in the pictures. I was wondering what I’m doing wrong. Sorry I didn’t see your comment sooner Susie. It all depends on where you put that last stitch. I get a straighter edge when working in the side loop like shown in the instructions for the sc rib stitch. Hope that helps!